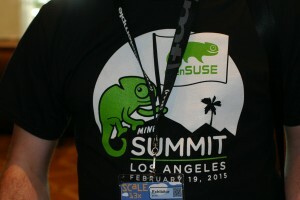 Hi Geekos, here is a small summary of our Thursday February 19th openSUSE miniSummit event here at SCALE 13x. Located in Century AB room, a 80 seats room, the average attendance rate was varying between 50% and 85%. What to expect from Btrfs on openSUSE 13.2? As the first major Linux distribution to have Btrfs as the default file system, what can users and developers expect from openSUSE 13.2? How is the systems capabilities enhanced? Btrfs has different performance characteristics; it’s a logging-style file system that provides fault tolerance, repair, and easy management features. The most well known advantage of Btrfs is the rollback capability with the open-source tool Snapper.